CES, one of the world’s largest consumer technology conferences, takes place every January, and sets the tone for the year in technology trends. Compared to CES 2018, te number of xR related companies exhibiting at CES 2019 grew, including those offering new, specialied technology for the location-based virtual reality sector. 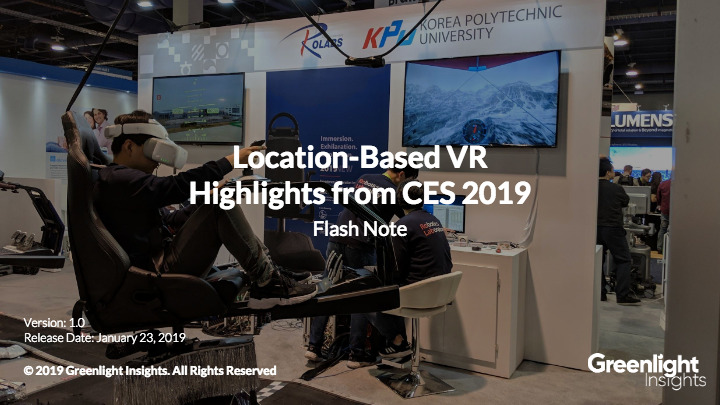 New LBE VR technology exhibited at CES 2019 was diverse in form and function - from low-cost HMDs to attendant-less VR systems to large-scale simulators. The variety of emerging systems and platforms on display will enable VR entertainment and edutainment in more types of venues, helping to grow the market.